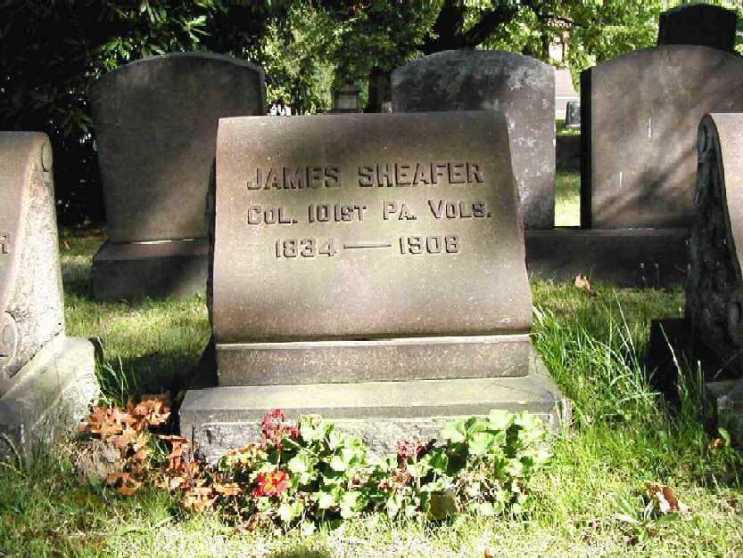 According to his wife's written recollections, in 1861 James Sheafer answered "the call of the President [Lincoln] for volunteers to put down the Rebellion" and enlisted as a Private in Company A, 101st Pennsylvania Volunteers. He was active in organizing the company, which was raised mostly in Allegheny County, and was elected by the other members of the company as 1st Lieutenant. He went to the front at age 26. The regiment's first major encounter with Rebel troops was at Fair Oaks Virginia in May 1862 where it suffered 129 casualties, approximately one third of the men present for duty. The two-day battle was considered a bloody draw, with the North losing 5,000 men and the South 6,000. Lieutenant Sheafer distinguished himself on that battlefield and was promoted to Captain. In the Spring of 1863, the 101st went to Plymouth, North Carolina, on the Roanoke River to form part of the garrison of the town along with troops from Massachusetts, Connecticut and New York. With the exception of occasional forays into the surrounding area, they saw no significant action until attacked by a large Confederate force under the command Of General Hoke in the Spring of 1864. The enemy gained control of the Roanoke River with the aid of the Confederate naval force's iron-clad ram "Albemarle". With this advantage, and an overwhelming force of five men to one, the Southern army seemed assured of victory. In spite of the odds, the garrison, under the command of General Wessells, fought fiercely. General Wessells explained the inevitable outcome in his official report, stating that, "This condition of affairs could not long be endured without a reckless sacrifice of life; no relief could be expected ... I consented to hoist a white flag, and ... had the mortification of surrendering my post to the enemy." The entire garrison was taken prisoner of war and shipped by boxcar to the infamous Andersonville prison in Georgia. Upon arrival, the officers were separated from the enlisted men, placed in a church for the night, and sent to various other Confederate prison camps. Many of the officers of the 101st, including Captain Sheafer, attempted to escape their captors, only to be recaptured and returned to prison. The letter which follows below this story, written by Captain Schafer while he was in captivity in Columbia, South Carolina, reached his family in Pennsylvania on December 20, 1864. It was smuggled through the Confederate lines baked in a corn cake to disguise it as army rations and delivered by a recently exchanged fellow prisoner, Captain E. Shroeder of the 5th Maryland Regiment. He reported that "Jim looks very well and is as heavy as he ever was," and that his fellow prisoners "are and have been getting along as well as could be expected under the circumstances and ... as long as they have money they can get meat, which they do not draw with their rations." In family correspondence concerning who would "get up the Box" a caution was given to "Be sure not to let any of the editors see Jim's letter or they'll publish it and spoil all his arrangements." It is not known whether the Box was ever sent or received, but the records indicate that Captain Sheafer and the men of the 101st were released several months later in the Spring of 1865. When the regiment was reunited after nearly a year of internment, almost half of its ranks had perished from starvation and disease. Captain Sheafer, being the senior officer present, assumed command of the 101st, which was not reorganized due to the surrender of General Lee at Appomattox Court House. 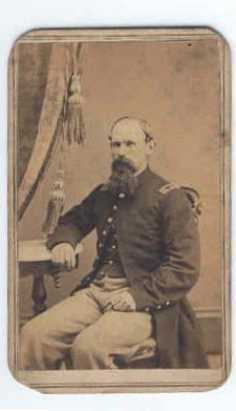 Captain Sheafer was promoted to Colonel of the regiment, which was mustered out of service at Harrisburg in June of 1865. Colonel Sheafer was born in Carlisle, Pennsylvania in 1834. At the age of eighteen, after receiving his formal education,he became an apprentice in the trade of making and finishing silk hats. Finishing his apprenticeship, he worked his trade in Baltimore and New York, and moved to Pittsburg in 1860. He had been a hatter in Pittsburg for a year when he enlisted in the army. After the war he returned to Pittsburg where he became a partner with his brother-in-law, William Wattles, in the jewelry business. When Mr. Wattles retired, the firm, located on Fifth Avenue, became Sheafer and Lloyd. Colonel Sheafer became a prominent jeweler of the city. In 1869 he married Sophia Louisa Miller. They made their home on Bluff Street overlooking the Monongahela River, where they reared a family of four children. 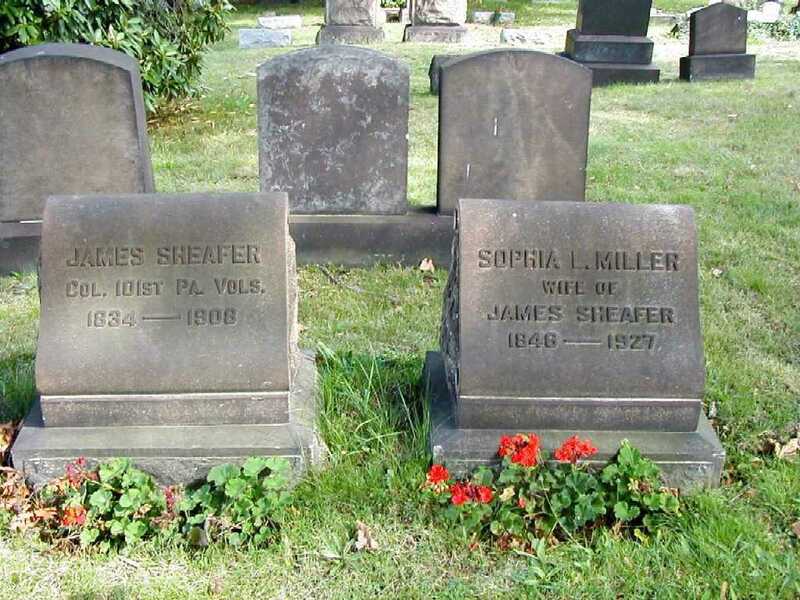 Colonel Sheafer died at the age of seventy-three and was buried in the ten-grave family lot he had established in 1881, when his six-year-old daughter died of scarlet fever. Three generations of the Colonel's family are now buried in the family lot. Your letter of Oct 9th was received on the 18th of Nov., also one from Mother at the same time & you cannot believe how glad I was to hear from you both as they were the first letters I had received from either of you. I would have answered your letter sooner but I had just written to you two days before, and I wanted to wait a week or so to see if there would be any prospect of exchange, if not I wanted to send to you for a box of things that I need. I see no prospect now of being exchanged soon & I have concluded to send for the things. Will you please get these things for me & I will settle with you when exchanged. I have now thirteen months pay due me & can't tell how much more will be due me when exchanged. I wish you could send me $20 in Gold. I can get 25 in confederate for one Gold & only 7 for 1 in Green Backs. You will please secrete it in the Lard or Butter or in some way that the Rebs can't find it. The following is a list of the articles I want. 1 Pr Government Pants if you can get them, 1 Felt Hat, size 6 7/8, and 2 Wollen Shirts-large size, 2 Prs Socks, 1 Silk Handkerchief, 2 rough Towels, 10 lbs fat Bacon, 2 lbs ground Coffee, 5 lbs Sugar, 5 lbs Butter (salted well), 5 lbs Hard Soap, 1 lb baking Soda, 1 lb Blk Pepper, ground, a little ground Cinnamon & Nutmegs, dried Peaches & Apples, & Quire of letter paper, i Pack Envelopes, Pens, Ink, 1 Cheap Portfolio, Pins, Needles, Thread, Buttons & 1 Hair Brush, 1 common Carpet Sack, 1 Fine Comb. Army & Navy Journal for the month of November & up to the time you send the Box. Harpers Weekley & any other reading matter you wish to send, 1 small Lutheran Hymn Book, 1 Green/leafs Arithmetic, 1 small Slate & 3 or 4 pencils. The above is about all I can think of & I guess you will think it is about enough. There has been a large number of Boxes coming through to the officers now & I think there will be no trouble in getting mine through unless Shermans operations interfere with the Flag Of Truce arrangements. Screw the Box together instead of nailing to prevent it from being opened. Send the Box as soon as possible. If there is any certainty of a General exchange of prisoners when you get this you need not send the Box. I don't need Shoes as I bought a pair here for the sum of $65. We buy sweet Potatoes for $20 per bushel. Butter $12 per lb. Bread per loaf (size of two fists) $1.50. Beef $3.00 per lb. Bacon $7 per lb. and everything else in the same proportion. For rations we draw 1 pint corn meal for two days, 1 pint of Grits (that is cracked corn), a little Rice & plenty of Sorghum Syrup & a small quantity of flour. We have not drawn an ounce of meat for over two months. If we had to live on our rations alone we would starve. We have had money enough in my mess up to this time that we could live very well, but what money we had when captured is now nearly run out. I expect to send this by an officer that will be exchanged shortly. I may have occasion to write some contraband news to you hereafter and I will do so with invisible ink which you can turn black by exposing to the heat of the fire. You may want to write the same way, for instance to tell me where you secrete the money you are to send me. The juice of a Lemon or a little Soda dissolved in water will answer the purpose. Use a quill pen to write with the Lemon juice. Any letter I will send written in that way, I will write "Dear Brother" with a small D & B instead of Capitals. I may write you a letter and then interline it with the invisible ink. Sherman has been playing hob with the Rebs in Georgia. We can't get much news from him for they have stopped the papers from coming into Camp since he commenced his movement. About 500 officers have escaped since we came here (to Columbia) I tried it one night but couldn't make it. I was sorry to hear of Jim Armors death. Where is Lieut Geissenhainer. Tell Miss Collins & all persons that have friends in my Co. that I have no way of hearing from the men, and don't know who or how many are living. Remember me kindly to all of Armors family & Gettys, to Charlie & Lottie, Mr. Newmyer, Graff, Mr. & Mrs. Hill & to all my friends. With much love to you both & a kiss to the children. I will close and may God bless & protect you all & bring us together once more. For Sharing Colonel Sheafer's Letter & Other Family Records"